Over 5 million Americans have Alzheimers disease and that number is predicted to double by 2030. 6 million children in the US have been diagnosed with ADHD. Multiple Sclerosis affects 2.5 million people worldwide, and Parkinson’s Disease affects 10 million. 1 in 5 people in the US have mental illness, and 12% of Americans suffer from migraines. The rate of autism in children has more than doubled in the past 10 years. I could go on and on. These are terrifying statistics, and it’s Dr. David Perlmutter’s mission to prevent these numbers from rising and help people improve their health if already diagnosed. A board-certified neurologist, he recently retired from clinical practice after over 30 years working with patients. He is the author of the bestselling books: Grain Brain, The Grain Brain Cookbook, Brain Maker, and most recently, The Grain Brain Whole Life Plan. His books have been translated into 28 languages and he has won the Linus Pauling Award for innovative approaches to neurological disorders. You can subscribe to my podcast through iTunes, Stitcher, or your favorite podcast app. You can also listen to the episode right here through the player below. If you subscribe to my blog by email, you'll get notified of future episodes. 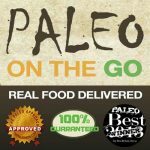 Paleo on the Go now sells Paleo AIP Tortillas at a lower price than anywhere on the web. You can buy them by themselves or as part of a Grass-Fed Beef Taco Meal. A frozen meal delivery service, they have a large menu of items for the paleo autoimmune protocol (AIP). I take the meals with me on vacation, and keep a stash in the freezer for emergencies. Read my detailed review here. Place an order here, and use the code PHOENIX for 10% off your first order. 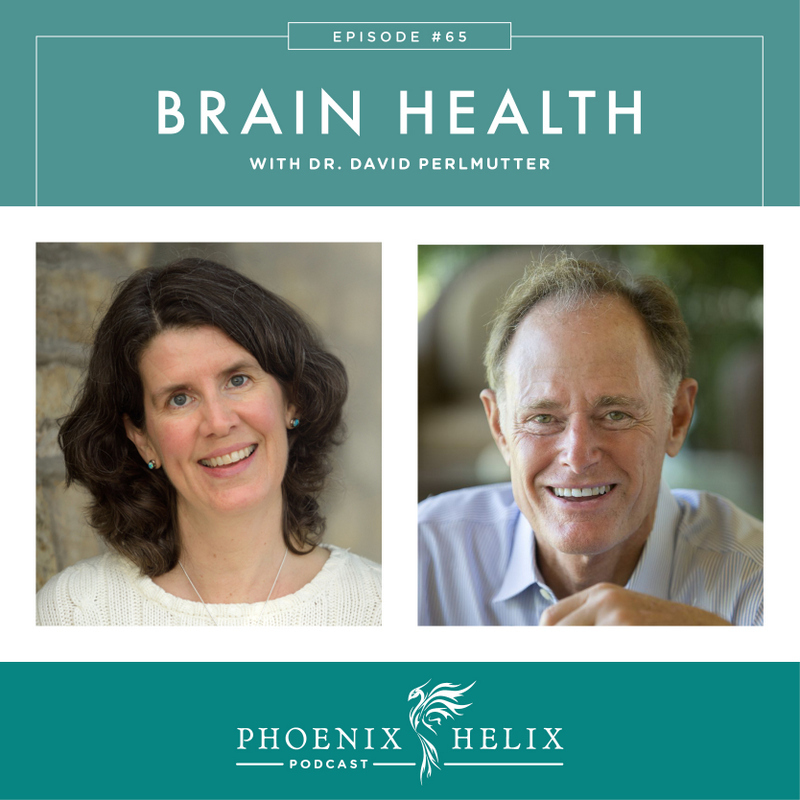 Dr. David Perlmutter worked as a neurologist for over 30 years. In the beginning he practiced in the way most MDs are trained – what he calls “diagnose and adios”. He prescribed medicine to treat symptoms, but had no way to help his patients improve their health. He found it very dissatisfying, which lead him to research other methods and eventually change the way he practiced medicine – using the power of diet and lifestyle to help prevent and reverse disease. Dr. Perlmutter is 62 years old, and his father recently died from Alzheimer's disease. So, this is a very personal topic for him. He “walks his talk”, doing everything he can to maximize his own health and lessen his risk for dementia. When it comes to preventing and reversing disease, there isn't a single magic pill, but rather a combination of interventions that can dramatically improve our health: exercise, diet, supplements, medication, stress reduction, sleep, social interaction, etc. He wrote The Grain Brain Whole Life Plan with this in mind. Dr. Dale Bredesen came up with this term (magic buckshot). He's conducting clinical trials into the reversal of Alzheimer's disease. The health of our microbiome has a direct impact on our daily brain function and also our long-term brain prognosis. Gut bacteria create certain chemicals that are essential to brain health, such as B vitamins and short-chain fatty acids. They create these chemicals (or not) based on the diet we give them. We are each eating for 100 trillion (the number of microbes living inside us.) Lack of diversity in our microbiome increases our risk for all chronic disease. And the greatest impact on microbiome diversity is our diet. Gut inflammation translates to brain inflammation, which is the cornerstone of all chronic disease including Alzheimers, Parkinson's disease, MS, etc. Some medications negatively impact both gut and brain health. For example, proton pump inhibitors increase the risk of developing dementia. 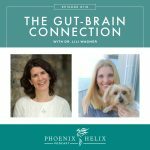 For more information on the gut-brain connection, listen to Ep. 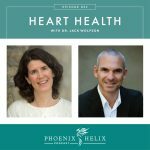 116: The Gut-Brain Connection with Dr. Lili Wagner. Probiotics refer to the beneficial bacteria in our bodies. Prebiotics are essentially food for those bacteria, which helps them multiply and do their beneficial work. Prebiotic foods: jicama, dandelion greens, chicory root, asparagus, jerusalem artichoke, garlic, onions, leeks. Resource: A to Z recipe roundup. Prebiotic supplements: avoid FOS and inulin, which can cause digestive distress. Dr. Perlmutter recommends acacia fiber. When Dr. Perlmutter was in medical school, they were taught that human beings could not make new brain cells, believing our brain cells automatically decreased as we aged. That myth has been debunked, and it's proven that the human brain can develop new brain cells throughout life. This is called neurogenesis. BDNF is a brain growth hormone linked to the development of new brain cells. The higher our BDNF levels, the lower our risk for dementia. Exercise is the most effective way to increase BDNF levels (and added bonus: it increases microbiome diversity as well). Resource: Podcast Episode 63: Exercise and Autoimmune Disease. 3 foods can also increase BDNF: prebiotics, turmeric (curcumin) and coffee extract. Antibiotics don't just kill the harmful bacteria but our beneficial bacteria as well. They can even damage mitochondria. Their overuse has led to the creation of antibiotic-resistant bacteria and is also strongly correlated with the diabetes and obesity epidemics, and diabetes is a risk factor for Alzheimers. At least 30% of the antibiotics prescribed in the USA aren't necessary. (Source: CDC). Both the cold and the flu (and most ear infections) are caused by viruses, not bacteria, so antibiotics aren't helpful. For many years, dentists gave certain patients “prophylactic antibiotics” to prevent the risk of possible infections. Research has shown this is unnecessary, so the guidelines have changed. So, the first step is to determine if a prescription is necessary. If you need to take antibiotics (there are times they are indicated and can even be life-saving), Dr. Perlmutter recommends taking a broad-spectrum probiotic in between antibiotic doses. And after you finish the antibiotic prescription, take some prebiotic fiber to rebuild your microbiome. Recommended Brands: GutPro Probiotics and Garden of Life Acacia Fiber Prebiotic. Resource: Missing Microbes: How the Overuse of Antibiotics Is Fueling Our Modern Plagues. A ketogenic diet is one where your body uses fats (rather than carbohydrates) as its primary fuel source. Ancestrally, this was a natural human state. Ketones (chemicals made when your body breaks down fat) are associated with reduced inflammation and increased BDNF levels and therefore can be very beneficial to brain health. However, there is controversy on the benefits vs. risks of this diet: Listen to Podcast Episode 20: The Ketogenic Diet Debate for details. Dr. Perlmutter's version of a ketogenic diet pays close attention to microbiome health. 3/4 of the plate are non-starchy vegetables, including prebiotic choices as well as fermented foods in that mix. The remainder of the plate contains a small amount of protein and lots of healthy fats, especially coconut oil and extra-virgin olive oil. Olive oil is high in polyphenols and has shown health benefits as wide ranging as cardiovascular health, brain health, gut health, and reduced cancer risk. Dr. Perlmutter eats it daily. However, olive oil fraud is rampant. This article will help you find the real thing: Will the Real Olive Oil Please Stand Up? Neurogenesis is the growth of new brain cells. Neuroplasticity is our brains ability to change and adapt in response to our environment, by building connections between those brain cells. The Grain Brain Whole Life Plan stresses the importance of a holistic approach to health, including not only diet but also exercise, sleep, stress management, social connection, gratitude, etc. Both acute and chronic stress raise cortisol levels in the body. The same thing happens when we don't get enough sleep. And higher levels of cortisol increase risk for Alzheimers. Sleep apnea is especially harmful for the brain. so Dr. Perlmutter recommends everyone undergo a sleep study. Social engagement is also deeply tied to health and longevity. And there's even a study that shows that men who have “bro time” lessen their risk for dementia. The “Nuns Study” showed that positive emotions even lead to a longer life. The Institute for Functional Medicine's annual conference this year is dedicated to the topic of Neuroplasticity. Research tends to focus on stress being bad and no stress being good, but there's something better than a neutral state, and that's love. Dr. Perlmutter believes love and other positive emotions are absolutely anti-inflammatory and beneficial to brain health. 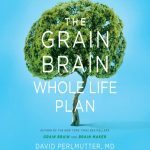 Dr. Perlmutter's books are Grain Brain, The Grain Brain Cookbook, Brain Maker, and most recently, The Grain Brain Whole Life Plan. His website is full of information as well, including links to all of the scientific studies he mentioned in today's podcast. He does a lot of live Q&A's on his Facebook page as well. He also has a PBS special airing in the next few weeks: Dr. Perlmutter's Whole Life Plan. Eileen (your podcast host) has written 4 books: A Simple Guide to the Paleo Autoimmune Protocol (paperback, kindle and audio versions), Reintroducing Foods on the AIP (PDF ebook), The Paleo AIP Instant Pot Cookbook (PDF ebook), and 85 Amazing AIP Breakfasts (PDF ebook). If you purchased A Simple Guide to the Paleo Autoimmune Protocol , you are eligible for some free PDFs – The AIP Food Pyramid, the AIP Foods to Avoid, and an AIP Grocery List. Send your receipt through my contact form. And if you loved the book, please write a review on Amazon. Check out the entire archive of podcast episodes. If you are already subscribed to my podcast: (1) Click the purple podcast icon. (2) Click on Shows. (3) Click the Phoenix Helix podcast image. (4) Scroll down the page, and you'll see Ratings and Reviews. Scroll down a little bit more and click on Write a Review. This will bring up the review screen. Tap 5 stars (if you love the podcast), and then click in the title box, and it will bring up the keyboard. Enter a title and short review. (5) Click Send in the upper right corner. (6) Thank you! Positive reviews give the podcast a higher search ranking in iTunes, helping people find it and letting them know it's a quality podcast and worth their time to listen. If you haven't subscribed to my podcast: (1) Click the purple podcast icon. (2) In the lower right corner, click the magnifying class. (3) Type Phoenix Helix in the search box. (4) Click the podcast cover in the Show list. (5) If you'd like to subscribe, click the purple Subscribe button. (6) To write a review, scroll down the page, and you'll see Ratings and Reviews. Scroll down a little bit more and click on Write a Review. This will bring up the review screen. Tap 5 stars (if you love the podcast), and then click in the title box, and it will bring up the keyboard. Enter a title and short review. (5) Click Send in the upper right corner. (6) Thank you! Positive reviews give the podcast a higher search ranking in iTunes, helping people find it and letting them know it's a quality podcast and worth their time to listen.